This means that when a pop-up dialog is presented you can hit Tab and Shift-Tab to quickly navigate the controls. When a button is highlighted you can hit Space to activate (or click) that button. The alternative is that not every control is a Tab stop. Again, unlike other applications (Firefox on Mac for example), Apple does not think all of the items on a web page should be a tab stop in Safari. Hyperlinks as an example—which are often used as buttons in some web page designs—are passed right over by default. 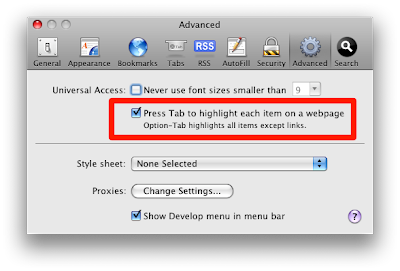 This will allow you to tab through all of the elements on a web page, much like most of the other web browsers out there. Given the keyboard power that Macs have—something I found quite surprising after I switched—I’m not sure I understand why the Tab key has been relegated to "optional" status by Apple in these cases. For people switching to Mac from Windows it’s a really good idea to make these two setting the default option; it sure would help with the adjustment period. 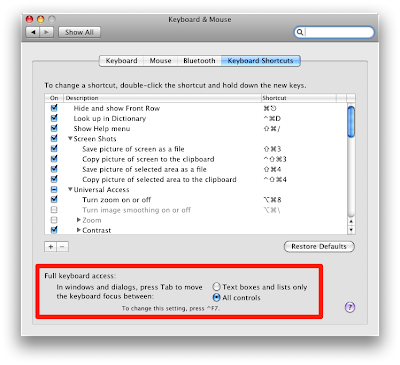 Got a tip for enhancing the keyboard experience of Mac users? Please drop a note in the comments!